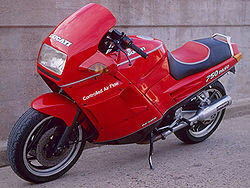 The Cagiva (from CAstiglioni GIovanni VArese) company, founded by the Castiglioni brothers, needed an engine - while Ducati, who had just been released from a difficult past of statutory public management (IRI), needed revenue. Over a series of Italian style meetings/lunches in 1984, they agreed a deal for Ducati to supply engines to Cagiva - and then go out of the business of producing motorcycles. 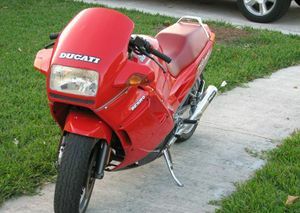 However, the Castiglioni brothers of Cagiva were eventually offered a deal to buy Ducati, subject to the Ducati name living on as an actual motorcycle product. On closure of the deal, Ducati engines were instantly installed in a number of Cagiva bikes, which included the Alazzurra and the Elephant enduro bike. At the time of the takeover, due to its financial difficulties Ducati was in a state of suspended animation with regards to engineering development. By that time, the classic bevel drive V-twin, which was old and expensive to produce, had been replaced by the belt-drive Pantah, designed by Fabio Taglioni. The Pantah was already known to be a strong and capable engine, and known to deliver in the Ducati 750 F1. The Pantah engine has been constantly developed up to the present day, and remains the only production motorcycle equipped with desmodromic valves. And around it they wanted a Ducati motorcycle unlike any other, that showed the world both Ducati's capabilities, and where it would go in the future. The challenge consisted in constructing a bike with innovative technical characteristics and image to fight the intense Japanese competition. To undertake the ambitious objective Ducati hired Massimo Tamburini, co-founder of Bimota. 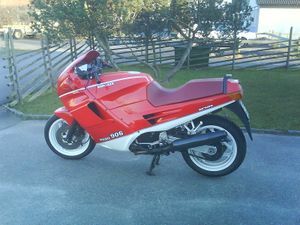 Tamburini would go on to design the Ducati 916 and MV Agusta F4 series, included in the Guggenheim Museum's The Art of the Motorcycle exhibition of 1988-1999, and the MV Agusta Brutale series. Tamburini decided to streamline the bike and its 750cc motor in a close-fitting integral fairing that hid all mechanical parts. The bike was equipped with latest-generation technical features: square frame tubes made in chromoly steel, rear aluminium swingarm with progressive suspension, 16-inch wheels with radial tires, air-and-oil cooled engine, electronic ignition and a comprehensive dashboard. 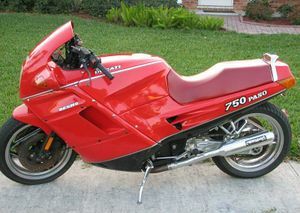 The finished design was christened the Paso 750, and debuted at the 1985 Milan Motorcycle Show. Ducati and Cagiva had hopes that the new machine would redefine sports touring motorcycling and complement their sportbike line, especially in the American market. Unfortunately commercial success didn't come, and worldwide the Paso 750 only sold 4,863 units between its introduction in 1986 and 1988. 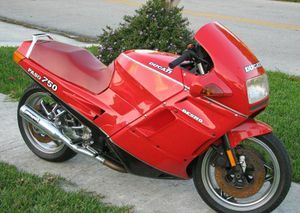 The Paso was more expensive and had lower performance (72.5 hp and 210 km/h top speed) than its competitors, and had some reliability and rideability problems with the electrical and fuel systems, due to the use of an automotive Weber carburetor, which was ill-suited to a small-capacity motorcycle engine. This page was last edited on 28 November 2010, at 20:41.